Hallux valgus (HV) is an orthopedic deformity of the foot necessitating a complex series of detailed evaluations for management. 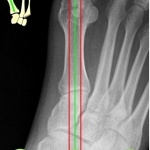 Measurement of angles between bones on radiographic images is used to determine severity of the deformity, monitor progression, and indicate the best course for surgical correction. 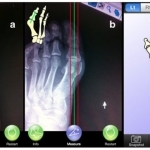 Such measurements were previously conducted manually in an error-prone procedure involving a hardcopy radiograph, pencil and protractor; however, in recent years this has largely given way to computerized measurements with greater reliability and validity. 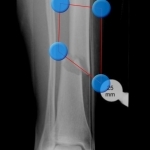 An interview with Matt Ockendon, orthopaedic surgeon, app developer whose medical apps highlight how medical mobile technology can be successfully integrated into modern healthcare workflows.